Courtney Colbert was looking for an opportunity to grow in more than one way when she decided to try out for the Minnesota All State Lutheran Choir. 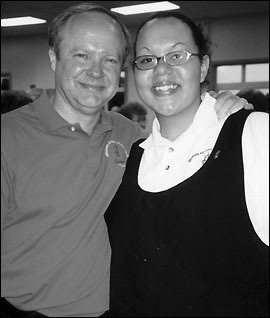 The 2004 Minnesota All State Lutheran Choir consisted of 48 students in grades 10-12 from around the state. Colbert said she had the opportunity to try out for this choir or "regular" all state choir, and she is very glad she chose the All State Lutheran Choir. After Colbert was accepted, she attended a camp in Alexandria in June. At the camp, the singers practiced four times a day for an hour and a half each time. "It was really fun," she said, "but it got really tiring after a while." The first day of camp she was "in awe" of how good the choir sounded, and it only got better, she said. After five days of camp, the choir went on tour for 12 days in 14 Minnesota cities giving 16 concerts. They did one concert each day at 7:30 p.m. except for Sundays when they did a morning and an evening concert. Courtney Colbert recently went on tour with the Minnesota All State Lutheran Choir for 12 days singing in 14 Minnesota cities. Above Colbert is shown with Tom Rossin, the choir conductor. Colbert said she couldn't name one specific thing that she liked best about the tour. "It was all just so amazing," she said. One part that she really enjoyed was getting to meet so many new people. "The people that I met there I just know will be friends of mine for the rest of my life," she said. Colbert and the group traveled to 14 different towns throughout Minnesota including Moorhead, Bemdji, Duluth, Albert Lea, and Spicer. At night they were hosted in groups of two by members of the congregation. The host families were amazing, she said, not knowing the students, but still supporting them nevertheless. The show that the choir performed was called "The Drum," a Christmas play with music. There was acting during most of the songs, according to Colbert. Colbert said that at the end of the 18-hour tour days the part that made it all worth it was seeing how their music and their voices touched people. It's awesome, she said, when the music really touches people. Growing in more than one way was a deciding factor for Colbert in choosing between all state choir and All State Lutheran Choir. "I had hopes that I would grow spiritually, too, and I did," she said. Colbert really enjoyed her experience and hopes to do it again next year.